I included this palette in my October favorites, but I like it so much that I wanted to talk about it a little more! This is a 5 color palette by Starlooks! It was sent out in the September Starbox. If you haven't heard of Starbox, it is a monthly program in which Starlooks send out a few of their makeup products monthly. It is $15 a month, and the products are all full sized. They are a small company and they make awesome, high quality products! While many sub programs tend to send out either their most popular products or ones they are getting ready to discontinue, I love that Starlooks sends out some of their newest products...in fact, we got this palette before it was even on the website! This is a very unique palette, in my opinion! 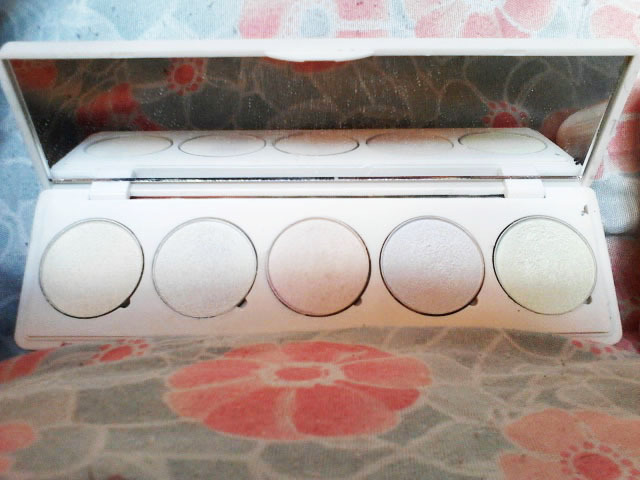 The five shades all have a white base. At first glance, they just look like pastels, but they are actually opalescent shades with gorgeous shimmery sheen. The five shades are gold, opal, pink, purple, and mint green. This palette was designed so that the shades can be used as a highlighter, on their own for a light shadow look, or over other shadows to alter their color. They are awesome! Nice and buttery and they are beautiful alone AND on top of other products. They go on sheer (in a good way) but are easily buildable. 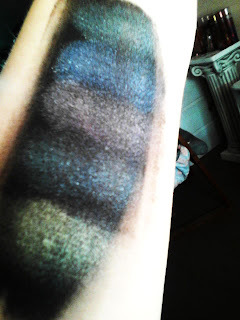 Here are the five shades swatched on Starlooks' clear primer. 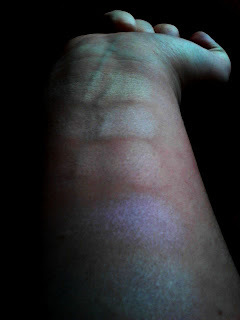 The lighting and angle are weird because I wanted to show their awesome opalescent sheen! This has become a daily go-to palette for me...they make perfect inner corner and browbone highlighters for any look. I'm really interested in trying more of the Starlooks shadows. What do you think of shades like these? What is your favorite daily palette? That's It. You convinced me. I ordered some black shadow & this palette. I love your blog - you always have such good ideas! lol, yay! I have fallen in love with these shadows, I use them almost daily! Try them out over all kinds of different colors... I'm super excited about December's box, I am ready to try more of their shadows. :) Loving Starlooks...I wish I had subbed earlier!